More redactions. Baskin takes grading authority from faculty. GTFF strike blog, days 5-6. Updated pretty often. Days 1-4 here. Also read the UAUO Facebook page, here. – Senate’s Academic Integrity Task Force takes swift action to revoke Blandy/Altman/Baskin strike grading diktats, here. 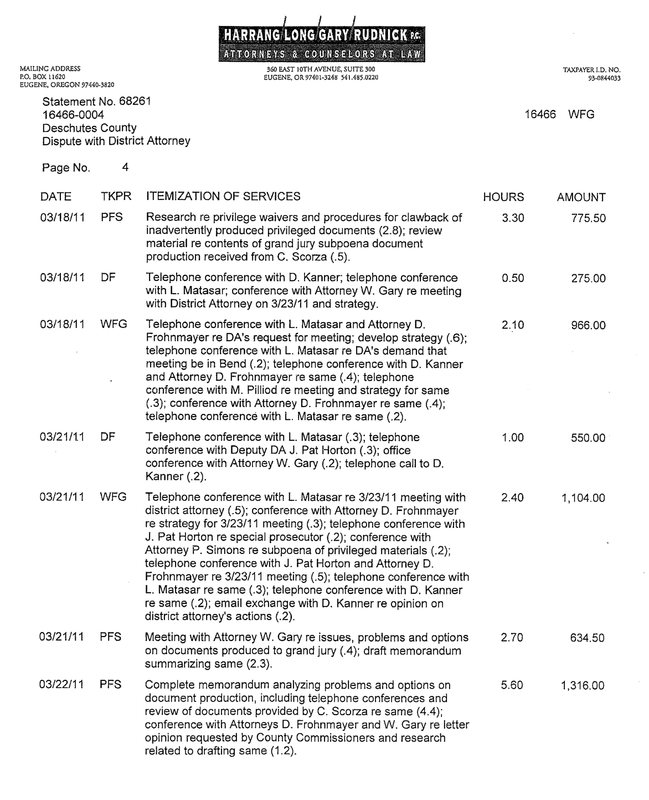 The complete, almost completely redacted invoices that Dave Hubin charged me $95 for, and then delayed releasing for a month until I petitioned the Lane County DA, are here. I am responsible for ensuring that you receive a timely grade for the work you have done in COURSE. On the Academic Affairs website (affairs.uoregon.edu/academic-continuity) the Provost has advised that students in courses taught or supported by GTFs may be given the option to forgo the final assignment/exam and take their current grade in the course. Please be advised that should the GTFF strike continue to Dec. 12, I will enter the grade you achieved in COURSE up to December 1 as your approximate grade for Fall term. This grade will be based on the grading information given to me by your Instructor. If you wish you may accept this grade as your final grade. In that case, you need not complete any further work for this course and the grade I entered will not be altered. If this is your preference please send me an email to that effect (jbaskin@uoregon.edu) by date XXXX. Be sure to include your name, student number, and the course number and name; you may include your understanding of what the final grade would be. I regret that, given the large number of courses with which I am working, I cannot give you the grade I will be entering at this time but I assure you that it will be based on the information your Instructor supplied for work competed as of Dec. 1. You have the option to complete the final exam / assignment as described on your course syllabus and/or by your Instructor. You may submit that work either to the Department of ZZZZ (LOCATION) or electronically (if this was your Instructor’s preference) by the date and time assigned by your Instructor. At such time as your work is graded, the approximate grade will be replaced by a grade based on all your course work, including the final assignment/exam. If you have any questions, please feel to email me (jbaskin@uoregon.edu) or contact me via Blackboard. The dawning of this new day is ominous, given that the administration’s purpose seems to be to break the GTFF strike and union, regardless of the consequences for academic integrity, shared governance, graduate education, campus climate and the university’s national reputation. So far it has defied the University Senate (the governing body of the university) and its legislation on strike-related degradation of academic standards, and it seems set to ignore the work of the senate’s emergency Academic Integrity Task Force. – Duck football coach picks up $225K in bonuses Friday. More for assistant coaches. His players, who have yet to unionize, get zilch. Ryan Thorburn in the RG, here. 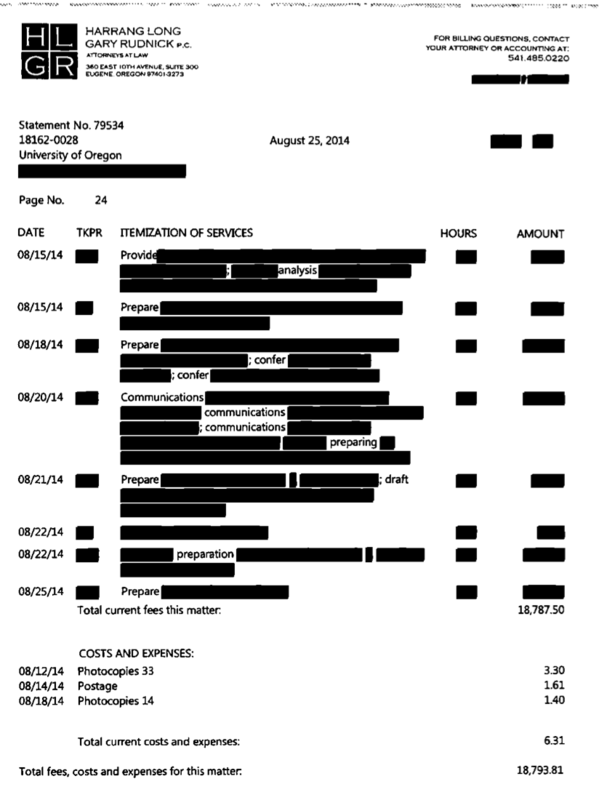 – The latest UO legal expenses. Some for the GTFF bargaining, some for the UOPD, some for things JH really doesn’t want to attach an accounting code to. More here. NCAA Bylaw 14.1.10.2: To be eligible to compete in a postseason event (e.g., conference tournament, bowl game, National Invitation Tournament, NCAA championship) that occurs between regular terms (including summer) a student-athlete, in his or her final season of competition in the applicable sport, shall have satisfactorily completed six-semester or six-quarter hours of academic credit the preceding regular academic term of full-time enrollment (see Bylaw 14.4.3.1). An institution shall have 14 business days (regardless of the date in which grades are posted or submitted) after the date of the last scheduled examination listed in the institution’s official calendar for the term that is ending to certify completion of the six-semester or six-quarter hours of academic credit. (Emphasis added). “The university understands and respects the decision by the teamsters to honor the GTFF’s strike,” Tobin Klinger, UO senior director of Public Affairs and Communications said. 103 Responses to More redactions. Baskin takes grading authority from faculty. GTFF strike blog, days 5-6. The appeal to watch the stupid game was probably the nadir for me in this whole catastrophic tragedy. I still cannot believe he was foolish enough to utter the words. I could have understood him doing so in a different communique, but within the strike update, after failing to explain why these folks can’t continue negotiating throughout the weekend given the gravity of the situation? The last thing in the world I care about is that stupid team or its damned chances of a championship. I seek in vain to find any evidence of benefit the sports programs have bestowed upon our University. Dirty classrooms, broken, ancient or inadequate equipment (with the exception of certain palaces, of course), faculty salaries far below comparator parity, and now, an Administration that will not deaI in good faith with its own graduate students. All I can see is an increased stream of earmarked donations funneling into the Athletic Department while the rest of the University continues a downward spiral into obscurity. So thanks for reminding us of the continuing tragedy that is the mindless emphasis on athletics, Mr. President, as that’s obviously the most important thing for us to consider at the moment. I guess all of us with Finals on Monday are just out of luck entirely. Meanwhile, I continue to field emails from worried students who missed their sections last week and couldn’t attend my review session, I’ve held office hours all day for two straight days and will do so again up to the hour of the final on Monday. Unlike these negotiating folks, I will not take the weekend off as I am swamped with work associated with this disaster. I’m sure others have done more, so I’m not holding myself up as some poster child here. Poor judgment and poor leadership. At long last, have you left no sense of decency? You may be doing this prep for nothing, if the recent email from ‘Friendly’ Hall (reproduced by the GTFF on its union website today, together with their version of events) is carried or extended: courses involving GTFs are getting unilateral grades assigned, and they’re making policy about finals being optional, et cetera, in Linguistics, Philosophy, and ES. Faculty are livid, because it was never even left up to them–a total usurpation of faculty control over their own courses, one that even cuts out department heads. This is going to cast a major, major pall over faculty bargaining this spring, and I know a few people over on the Soc Sci side who were agnostic or even skeptical of the union before but who are outraged enough to overlook that now. Who’s in charge at the admin? Who’s really making these decisions? They won’t say who, and they won’t say why, though we all have a pretty good idea–and it’s not anyone who seems to care about the academic mission beyond the money it generates. I think it’s clear now that the Board is advancing a motion to take complete control of all policies at UO who is whispering in Coltrane’s ear. We should just call him President Lillis and his dancing puppet Coltrane. UAUO says the associate dean of humanities, who is a religion scholar, is going to assign grades in philosophy, linguistics, and ethnic studies based on partial work. At what point do some undergrads or parents say I’m not getting the education I paid for? Accreditors? And isn’t that also a threat to financial aid funders, who are paying for someone to get a quality education? Coltrane says that UO staff are “volunteering” to monitor GTF-taught classes, but this is not true. Officers of Administration received an email from UO administration offering $25/hr “overload” pay to help out. Volunteers are not paid. Coltrane is not telling the truth. Supposedly they can decline (for now) to accept the roles, so that’s the justification for calling it voluntary. But it’s been made very clear to my spouse (who is non-union with the UO) that the admin will direct ‘qualified’ UO employees to perform these functions if they deem it necessary. Of course, they’ll be paid, but the term volunteer is used VERY loosely here as you point out. How anybody could read things like this and still not support the GTFF is beyond me. The administration is breaking rules, policies, and perhaps laws right and left, is lying to everybody, and is just blatantly abandoning the academic mission of this university. At this point, I think the only reason UO offers classes at all is because the NCAA forces us to pretend the football is amateur. I don’t support the GTFF because I don’t see the administration’s actions as you describe them. From my perspective the admin was put in a very difficult position and has done the best it can do. It’s easy to criticize when you don’t know all the facts, but I think Coltrane is a very smart and reasonable person. He does know all the facts and these are the decisions he’s made – that doesn’t mean they’re the right decisions, but that does have weight with me (I understand that it may not for others). The union on the other hand, has done an excellent job of whipping the grad students (and others) into a frenzy to the point where my opinion is that the students are behaving unreasonably. Some of the justifications for their position that I’ve heard are pretty out there and I think some real damage has been done because of that. The students should have accepted the compromise – if the admin doesn’t manage the leave fund well then that’s good ammunition for the next round of bargaining, which isn’t far away. Instead they want everything and they want it now. So this comes across as a power play – one in which they’re willing to screw their students over in order to achieve (the justifications for that have been particularly ridiculous). Very disappointing. How can you call Coltrane a “smart” person when the position he is taking directly contradicts all the research he’s done on parental leave? What he’s doing is saying that research doesn’t matter when applied to actual people, which is saying that research doesn’t matter, and that is not exactly what the head of a research university ought to be saying. Coltrane isn’t taking a position that “directly contradicts all the research he’s done on parental leave”. That’s GTFF spin. Another way to look at it is that part time employees typically don’t receive paid leave, but Coltrane still tried to come up with a solution, one that seems very reasonable to me. He didn’t want to put that solution in the CBA for reasons that you don’t understand, but it’s still better than what typical part-time employees receive. And to say any of this means that Coltrane is “saying that research doesn’t matter” shows how absurd this whole thing has gotten. At this point I think all sides in the parental leave issue have made their opinions pretty clear. I’ll post additional comments only if I think they add new information to the discussion. Quick point of clarification: the GTFF has not rejected any compromise. The compromise that was offered, was offered as an agreement between the President and the Dean of the Graduate School about how grad students would be treated. The GTFF response was that the bargaining process was between employees and employers, and if the administration wanted to put the major tenets and protections offered in the compromise into our contract, we would welcome that. It was at that point that the administration team quite literally walked away from the table, and they have since refused any CBA language governing the plan. It is at best misleading and at worst intentionally misrepresenting the GTFF position to say that a compromise has been rejected. OK, that’s it. No more comments on this, please! I’m tired. Daycare centers on campus are cleaned daily. I am sure most homes are not as frequently cleaned, ever. “Philip H. Knight Professor” never sounded so apt. This is so out of control. I now have several emails from students that are wondering if they need to show up for the final or they can take their current grade as their “approximate” grade. So yes they have to show up and take the final, and now I suspect a few /many of them won’t. No kidding. What if students don’t show up for a Monday final and the strike ends Tuesday so that the alternate grading scheme does not go into effect? What a mess. President Coltrane, end this strike. Coltrane left bargaining to go watch the game. Scott was sending a message that his loyalties are with athletics. Anyone who doubted his intentions because of some paper he wrote a long time ago should wake up. He could sign the agreement right now and end the strike, but chooses not to. Chuck might fire him as president, but he’d still go back to being a tenured professor. He genuinely wants this. I support paid leave. I don’t support paid leave for GTFs. I may be wrong. I may be misguided. But I don’t think I’m a bad person for holding this opinion. Many of my friends are GTFs and many of them are outspoken supporters of the strike. I completely respect their opinions, and I am glad they are backing up their convictions by taking action. That being said, I have felt incredibly uncomfortable during the last few weeks. I’ve only expressed my opinion on the strike to a handful of close friends because I worry that expressing my opinion will jeopardize many of my relationships. Maybe I’m wrong about that too. I hope that my friendships with my fellow graduate students are strong enough to weather a little disagreement. However, the way that I have seen the people who oppose what the GTFF is asking for makes me worry that if I voice an opinion, I’ll be perceived as evil, dumb, naïve, etc. Maybe I am overreacting, but I don’t like the way I’ve been feeling. I want to be able to express my opinion. I want to be able to talk about this issue in a reasonable, respectful way. I think the vitriolic rhetoric coming from BOTH SIDES needs to stop in order for a resolution to be reached. I wish there could be a new vote to strike or not. The offer of the $150k fund really has narrowed what the strike is about. No longer is it about if people have a way to be paid after medical emergencies, but rather it is about if proper respect is given to the “employee” role of the GTF versus the student role. The union, of course, wants to emphasize the employee role as it strengthens their power. The leaders of the union are now asking the union to strike over consolidating their power more than serious differences in the lives of the union members. All we want is for the rules to be in the contract. The admin are unwilling to do so. As a GTF I support continuing the strike over the administrations refusal to include any rules about the hardship fund in the CBA, not because I want to see the unions power strengthened, but because I have zero faith in the administration to allow consistent and fair use of the fund if it is not guaranteed in writing. With the way the administration has been conducting these negotiations, a hardship fund that is not legally binding and in the CBA seems like a PR band-aid for them to be able to claim that they are trying to deal now and then turn around after the strike and stop any implementation of paid leave. I’m not a GTF, but I can say from experience and with authority that if you don’t get it written in the contract the administration will back out of the deal, as they regularly do with the other unions on campus. It is challenge enough getting the administration to follow what they do agree to in writing. No. The GTFF is not trying to “consolidate their power”–as others have pointed out, they’re just being pragmatic given UO’s track record. The converse is true, however: The UO administration is hell-bent on not giving up anything which might later give the GTFF a bit more leverage. This is why they won’t put the details of the hardship fund into the contract. This is a total, and I suspect willful, misreading of the union’s position. As others have pointed out, the issues that led to this strike are ones of vital importance to a majority of the members of the GTFF. And they’re easily understandable to anyone who (a) takes a few minutes to try, (b) works for a living, and/or (c) has any empathy for people who do work for a living. Unfortunately this campus, like this country, seems to have more than its share of people who, while no doubt engaged in (b), are unwilling to do (a) and/or unable to do (c). And so we get knee-jerk reactions such as your assumption that the GTFF leadership is doing this as some sort of power play. Where’s your evidence for that assumption? Where’s your evidence for thinking that the GTFs are doing this for any reasons other than the ones they have stated, clearly and respectfully and repeatedly? If you don’t think they deserve the things they’re asking for, say so. Make that argument. It isn’t as black-and-white as you make it out to be Jack. At least not to me. For one, do GTFs “work for a living”? They’re part time employees so from that perspective they’re asking for things that are very generous relative to what a typical part time employee would receive (although the union has convinced the students that these things are their “right”). So I’ve done (a), (b), and (c) and I don’t come to quite the same conclusion as you do – I agree with the poster above who said that this looks like a union power play. By your standards, many faculty probably qualify as “part-time,” since their teaching loads may be comparable in hours to GTFs. The point is that they are all academics who have more than just teaching responsibilities, whether you want to call it graduate student research/publication or faculty research/publication. I’m sure some GTFs have moonlighted on the side, but it’s not a reasonable expectation for them to hold down another job. The tired argument about GTFs being part-time is laughably circular, and the whole discussion about what is or is not “work” is a red herring. Regardless of how many hours GTFs put in, UO caps FTE at 0.49 for the express purpose of categorizing them as part-time so that they don’t qualify for full-time benefits. Then they turn around and argue that GTFs don’t deserve benefits because they’re “part-time.” Maybe we need a new employee category for GTFs that’s reality-based rather than rhetoric-based. Please pick a better screen name. While I understand it is not easy to hear that your opinion on something upsets your friends, being told that the work you do makes you undeserving for a minuscule amount of paid leave to be used only during medical emergencies or by new parents is an upsetting thing to be told. As a GTF I could understand and even see myself not supporting paid leave if it was going to be an crazy expensive plan or if we were in a time where the university was hurting for money, but the fact is that this will cost the university a small amount of money in the scheme of things and will drastically improve the living situation of the people who need it. I understand the desire for debates that are civil and don’t make people uncomfortable, but when you are actively having to fight for basic things like a living wage and not having to go to work the day after having a child discussions are understandably going to get heated. Are you making a living wage? I’m still trying to figure out what is meant by a living wage when it is being discussed. If you’re the same “confused” as on the other thread, then either you’re not reading the comments carefully, or you’re a troll. The arguments for why the GTFF is asking for what it’s asking for have been laid out clearly, passionately, and repeatedly. If you don’t agree, then you don’t agree. I am sorry that I am not getting it, so I would appreciate it if you could clarify for me, since your comments were part of the confusion. I understand the arguments why, I am just confused about the term “living wage” and how the GTFF is applying it. You yourself linked to the MIT site that said a living wage is a wage that would allow you to live in a community if you were working full time. But then the argument became less clear to me. I take it you think that GTFs should be paid more than a living wage (twice as much), since they work half time. That is, the definition of a living wage is not the MIT definition you used, but just that everyone should get some minimum yearly amount, even if working part time. And to justify it, the arguments appear to be that GTFs are not allowed to work more than half time, and/or that their taking classes should count as hours of work, even if they are not formally employed for those activities. I support GTFs getting benefits, and support that GTFs should have enough to live on. I am just wondering about the use of “living wage” since it seems to me that GTFs are getting a living wage by your own definition of making a certain amount per hour that if they were working full time they would have enough to live on. Maybe being pedantic is inappropriate or makes people defensive, but on the other hand it helps the GTFF if there is a clear message, and I think the varied use of this term isn’t clear. Unbelievable. When you signed on as a GTF, you signed a contract accepting the terms of employment and the stipend that you would receive. You knew exactly how much you were going to make. All GTFs go through this, and the smart ones figure out if they can live off of the stipend as stated or not. Where is the personal responsibility? If you had any problems with how much you were going to be paid, you should not have signed on the dotted line. Eagerly accepting the stipend in advance and then crying about how you are not making enough a couple of months later doesn’t exactly produce much sympathy. I wonder how many undergrads working their way through school would feel that you deserve a “living wage” when you can get an advanced degree tuition free. It doesn’t matter whether or not you personally support paid leave for GTFs, in the same way it doesn’t matter whether or not you personally voted for Obama. The GTFF got a very clear mandate from its membership as a whole that this was a vitally important bargaining issue, so that’s the way the GTFF negotiators have been playing it. The union is successful only to the extent that GTFs stick together. Don’t make the mistake of assuming that what happens to the GTFF doesn’t affect you–it does. Busting the GTFF would thrill the UO administration no end, and the most efficient way they can accomplish that is by dividing the ranks. If you don’t agree with something the union is doing, then go through the union, your union. And get involved early in the process. Now is certainly not the time to “express your opinion” if it weakens the union. Ugh. If the administration wrote “Now is certainly not the time to ‘express your opinion'” we’d all be furious, for good reason. We should also be furious if that’s the GTFF’s position. I want to see the GTFF prevail. Weaker parties prevail when they stick together and stick to their guns. Diversity of opinion is great, but it should be hashed out before you commit to an extreme action like a strike. haha, NO. I don’t give up my rights to free speech and opinion by virtue of being in a union. Perhaps you could not tell from my screen name, “different anonymous”, that I am not a GTF, and therefore not a part of your union. However, thanks for letting me know that your union does not support GTFs expressing their opinion if it differs from the opinion of the majority. I’ll keep that in mind should I ever become a GTF. I am a GTF, member of the GTFF. I support the strike, I support the idea of paid leave. But I support it not because I think it’s some kind of “right” but because I think we need to attract better grads with a more competitive benefits package. To the non-unionized GTF, I respect your position. Please do not think that ‘different anonymous’ speaks for the GTFF. I hope he/she was not trying to. I agree with Oryx that a similar statement from someone in admin could be a huge spark in this strike. Besides, if a dissenting voice and opinion is enough to weaken the entire union and its position, it probably wasn’t very strong to begin with. +1 for reasonable discourse. The administration (and some on the ground) have already made this issue toxic enough imo, regardless of our positions we should be willing to actually talk about them. Non-gtf grad student, I for one would be happy to hear why you think GTFs shouldn’t have paid leave. er, no. We can express our opinions at any time, whether they line up exactly with the union’s opinions or not. UO Grad Student, thank you for demonstrating that not all members of the GTFF feel the way “different anonymous” does. I think it is important that everyone feels they have a voice in this debate, and evidently so do you. Once a GTF, I honestly feel that the GTFs at UO are already being offered a fair and competitive compensation package. As a grad student paying out of state tuition, I would love to have my tuition paid for on top of health benefits. Instead, I work at a job, a job at the university by the way, where I am provided neither of those things. I know that GTFs work hard and are deserving of the university’s recognition. I would never deny that. However, I believe that at less than .5 FTE, GTFs should not be eligible for paid leave. I know that GTFs put in more than 25 hours a week between their work and their school, but in my mind it doesn’t change the fact that they are students first, and employees second, and the time they are being compensated for is the time they spend working, not studying. I know this is an unpopular and divisive stance, and I know the many arguments against it (arguments which I am very open to considering), but that is my personal view of the issue. Again, I respect the opinion of the GTFF, and the right of graduate students to negotiate for what they feel they are owed. Non-gtf grad student, would your perspective on the ‘competitive’ part of the compensation package be at all swayed by the fact that other schools we compete with *do* offer paid leave, especially for new parents? UNC students get six week of paid parental leave (unfortunately only for one parent if both are students), although their medical leave is structured differently. It’s also important to note that in the GTFF’s version of paid leave, the leave wouldn’t kick in until the second week, so if a GTF had a minor illness, they would still be forced to make up that time. While there are a lot of GTFs who do work less than 20 hours a week on their actual GTF assignment for various reasons, there are also a ton of GTFs who are working more than that on just their GTF position and are therefore 0.5 FTE on paper only. While GTF positions and workloads vary, paid leave is especially important for GTFs who are instructors of record, or whose departments have been particularly reticent about allowing them to trade time with coworkers (in the sciences, for instance, it’s easy to get other people to cover a lab or discussion session because there is often more than one GTF assigned to a class; in other departments this is not the case). I’ve heard the “students first” argument a lot, especially from the administration, ans while that’s not an entirely unreasonable stance, GTFs are the people who the school has chosen to do that work. Sure, a grader is a student first, but someone [the department, college, or administration] decided that it was easier to pay a lower wage to a graduate student in order to get that job done than to pay someone from outside, who in all likelihood would have to be paid more (this is especially true for GTFs who are instructors of record or who are researchers, who are dramatically less expensive than similarly-qualified non-students). Thanks for the honest, non-snarky response. You’re smart if you have the energy for it! Non-GTF Employees at the University can get massive tuition discounts and perks like paid leave. However, if you’re in a different bargaining unit you’ll be facing the same challenges next year when the administration tries to crush them too. In many of the top graduate programs one IS paid to be a student: the first two years of study, and at least a year of dissertation writing are financed by fellowships. The Old Grey Mare is right. Even the Three-Toed Sloth was once paid to be a student. For two years! could someone – maybe from the gtff? – maybe clarify why the admin’s offer of $1000 medical coverage and $1500 childbirth coverage isn’t as good as two weeks’ sick and parental leave? the form that the compensation takes is obviously different. but on the face of it the administrative proposal covers all graduate students (not just those that are gtfs) and also provides as well funds to students who need it in in addition to the informal (and thus unguaranteed but usually de facto) time off that many graduate teachers get from their departments when they are sick, suffer injury, or accident? i am not on either side of this. but this point remains very unclear to me in the discussions i am finding online. is it just that nobody trusts the administration to follow through at all? will they put it in writing somewhere even if not in the contract? Not from the GTFF, but my understanding is that the GTFF came back with language for the CBA that would make the hardship fund acceptable and the admin refused to put it in. The offer is okay, but only if it can definitely be accessed, and without language to guarantee grad student use of the fund, it would basically be at the whim of admin whether or not your hardship was good enough to qualify. Additionally, since my understanding is that the amount in the hardship fund would be tied to GTF numbers to some extent, the GTFF would now be in the position of protecting non-GTF grad students, which is not the purpose of the union. That said, it does appear that the GTFF was willing to take the fund if everyone could use it, and frankly no, no one trusts admin to honor anything that isn’t in the CBA. The admin’s offer is for _up to_ $1000 medical coverage and _up to_ $1500 childbirth coverage, with the actual amount being at the discretion of the Dean of the Graduate School. Good question. The public information is that while the administration will write the existence of the fund into the contract, they have refused to write in any details into the contract. The reality of this is that it isn’t a guaranteed protected benefit at that point. Only the details written into a contract can be later utilized or contested. Unfortunately, the administration has crowed their “achievement” to the entire student body, stirring up resentment toward the GTFs, only to remain silent on the fact that they’ve actually offered nothing. I’m not GTF, but have you ever bought a used car? Words in a union contract are legally enforceable. In contrast, words in an MOU are just words, from someone who’s refusal to put them in a contract clearly shows that they don’t want them to be legally enforceable. More confusion because now I see there is language in one contract proposal. : see pg 3 section 8 of link below. what language is not there that the gtff wants in there? asking because so confused about all the information getting around on this. thank you. At this point, it’s not really clear where we are in negotiations. Coltrane’s last email certainly made it sound like we were back to paid leave, but I suspect the real sticking point is automatic qualification for leave/whatever remedy is on the table. Thank you this helps a bit. Lack of trust on all sides seems to be a major impediment. I agree it is tough to trust where there is turnover. Also it is tough to trust that the grad school admins running the fund would have the grad students interests first. One would hope so. But I see better now why they worry. At some point trust has to kick in. Anyone with union experience knows that no contract can cover every conceivably possible contingency. But where trust picks up is really hard to say for another person. Good luck gtfs and grads! Fund’s appeal procedures”, which is to beg before the Provost. The requirement that “requests shall not be unreasonably denied” is in the Memorandum of Understanding rather than the CBA. The administration could unilaterally remove that statement and deny requests for any reason. Furthermore, university “appeals” are pretty much worthless, and the first three steps of an Article 13 grievance are through the university. In other words, unless the GTFF is willing to take the grievance to a labor arbitrator, UO will get to unilaterally decide whether or not they are honoring this arrangement. Christie, please quote the language from your link to the admin proposal which you believe shows that the GTFF could contractually enforce a decision by the admins to deny sick or parental leave to a graduate student. I don’t see any. I don’t know that’s why I ask. The last two sentences are not enough? Why is that not enough? Honest question. I do not understand the view here. Of course no language pertains to leave there — it’s all just monetary compensation in an amount that after taxes is probably slightly more than two weeks pay for the average gtff (& obviously well more than the zero compensation received by nongtff graduates on the gtff proposal). I don’t have the answer I just want to understand what makes this offer not acceptable given that on its face it covers all grad students not just gtff grads and so seems better from the point of view of helping out all grads in need. My knee jerk reaction is to support gtff but I find this point confusing for me. I don’t disagree that, if the fund were operated in a fair, above board, sympathetic way, it would be good for all grad students on campus. However, the GTFF can’t reasonably be expected to agree to the fund without a guarantee for its members in order to share the wealth for people that the union doesn’t represent. That would require a degree of altruism which the administration has refused to display for a year. My own opinion is that I’m disappointed that the graduate students didn’t agree to this compromise, which seems very reasonable. I agree with the comment above that stated there has to be some level of trust and that not every single detail can be accounted for in the contract. Apparently there are legitimate reasons for the admin to not want to include this in the contract so a compromise seems warranted. Instead we get, “What do we want…everything”, “When do we want it…NOW”. And watching all the strikers makes me think the “ethical discourse” letter has a certain amount of irony at this point. OK, what are the legitimate reasons and how was the administration put in a difficult position, as you say in your 8:47 comment? I said “apparently” there are legitimate reasons – in other words I don’t know them and clearly you don’t know them. But I trust the university leadership enough to think that they are holding out far a very good reason – they aren’t just doing this for fun or to poke at the GTFF, as much as the union would like everyone to believe that. Others may not have the same level of trust and that’s too bad, but realize that union and UOM spin (and look no further than UOM’s headlines to realize this is spin) is designed to whip everyone into a frenzy and undercut that trust. I’ve said in another thread that I believe they do have a very good reason–I think they don’t want the union stepping in when a non-GTFF grad student’s claim is denied, because they view that as a potential precedent for GTFF advocacy on other matters which are currently the sole, non-accountable purview of the university administration. I’ll leave it to you to judge whether such a reason is “legitimate.” Cf. the pending action of the BoT regarding the Senate. So this strike is a power play then. You’ve got it backwards–the administration’s refusal to sign the contract is the power play. The GTFF is just trying to protect its members. Well, there’s your problem right there. You insist that there must be legitimate reasons for the admin to oppose the GTFF’s demands. But you don’t know what they are. You just “trust” the administration, seemingly reflexively, and evidently you distrust the GTFF – or is it all unions? – just as reflexively. The GTFF has been dealing with the UO administration for decades. Many of us in these comment threads have been dealing with the UO administration, on a daily basis, for years or decades. Furthermore the university community has been getting direct communiques from the administration on a daily basis since this began. If the GTFF (along with other people on campus) lacks trust in the administration, perhaps they have good reasons. Many of us feel we’ve been lied to, manipulated, and exploited, and that the educational mission of the university has been compromised nearly beyond recognition, by this administration. You call union communiques “spin,” but there’s been nothing in the GTFF’s statements that begins to approach the level of disingenuousness found in these emails we’re getting from the offices of the Interim President and the Provost. Evidently that doesn’t bother you. You seem to be putting a lot of weight on the GTFF and giving the administration a profound pass. Yes, ‘apparently’ admin has good reasons for every action they have taken, but they have never shared them and those reasons which they have given have been obviously obfuscation at best. On the other hand, the many reasons why the hardship fund would have been acceptable, IF additional protections had been included, are described in the thread above; your description of the compromise as ‘very reasonable’ makes me think you are willfully ignoring the GTFF’s perspective and taking administration’s claims without any consideration. Trust has to run both ways, and it’s been clear from the beginning that the administration does not trust the GTFF. After a year of being treated poorly, the GTFF no longer trusts admin, and so while not EVERY detail can go in the CBA, the GTFF will make sure that enough details go in to protect their memebers. That’s the point of a union. If the administration wants to write the GTFF CBA with a handshake and a cocktail napkin, why the need for the expensive HLGR lawyers? Hey, UOwe admins seem to be making history, a bloodless coup d’etat of a Faculty Senate. Y’all, except those ensconced in JH, have been overthrown, and in your place, a non-accountable, opaque group of corporate generals has taken over the joint. 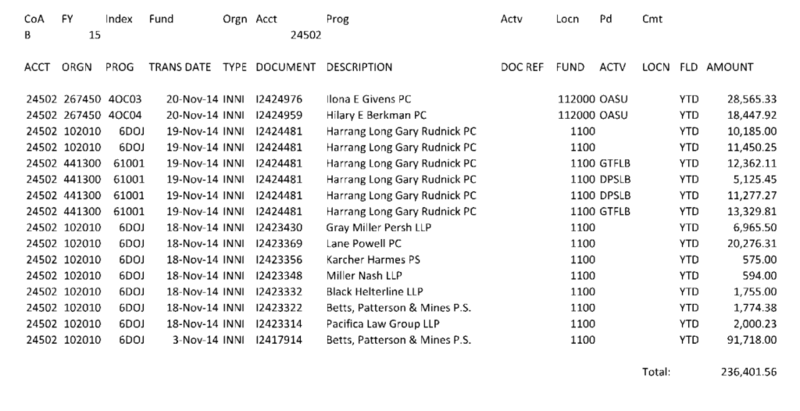 O of Owe is now a northwest banana republic…. The divide between people with differing opinions on this thread represents, I think, the largest issue with the strike overall. There is a lot of misreading happening, much of which (I hope) is unintended. This misreading has resulted in people on all sides digging in. I don’t think this is helping anyone. I am sympathetic to the people who think the union wants everything now instead of making some concessions and trying for the rest in the next round of bargaining. I voted to ratify the contract we were offered and I voted against authorizing the strike. When I expressed my concerns, I was told that I was anti-union (I’m not), that I obviously don’t care about the wellbeing of graduate students who are less fortunate than me (I do care), that I was unethical (I strive to be ethical), and that I should be ashamed of my position (I’m not). Other union members who have agreed with me in private have been unwilling to say these things publicly because they don’t want to be stigmatized. It is extremely difficult to support your union under these circumstances. It is extremely difficult to even want to support your union under these circumstances. I had the opportunity to sign the open letter about ethical discourse. I declined to sign it even though I strongly believe in its message. I did this because a similar message was not being sent to the union. I want to hold all sides to the same standards. Despite all of this, I still walked out on strike last week. I was in the minority of union members who voted, so a strike was going to happen with or without me. I was hoping that if enough members went on strike, at least it would be short, which would be the least damaging for our students. I was worried that if many of us continued to teach, the strike would go into next term, which would be terrible for students. So I went on strike. Unfortunately the strike has continued longer than many of us were hoping for and I’m worried it will last even longer. I have not been a fan of some of the union’s strike tactics. I dislike how loud the picket lines have been and that they have disrupted undergraduates who were attending classes still in session. I was so displeased with this that I was ready to return to my classroom. Then the administration made final assignments and exams optional in some classes but not others, thus providing students with unequal opportunities based on which classes they happened to be enrolled in this term. The administration has ignored the concerns of the faculty senate and the board is voting on a policy that will essentially dissolve it. How could I go back under these circumstances? What are we supposed to do when we’re angry at both sides and don’t trust either of them? I don’t think there are any good options left. At this point, I think it’s about choosing the lesser evil, and for me, that means standing against an administration that is sacrificing academic standards, undermining faculty, and investing in athletics and legal consultants over students. I respect and appreciate what you are saying. And I am disappointed that individuals, not “the union”, would treat you so poorly. Such statements may reflect individual frustrations or lack of character, but do not characterize the GTFF 3544 as a whole. Having attended nearly every bargaining meeting despite not being a GTF, I was struck how the GTFF made significant movement over time towards the administration’s position, while the administration held strong time and time again. Jeff Matthews, the administration’s lead bargainer and lawyer from HLGR, told the GTF bargaining team on separate occasions both that compromise was not mandatory in negotiations if one side concedes all to the other and that he personally has no bargaining experience within the current environment. This is also confirmed by his LinkedIn profile featuring several strongly endorsed areas of expertise except for Labor Management and Labor Bargaining – of which he has zero endorsements. I sincerely hope to find that this strike ends sooner rather than later. After day one, if not the night before, would have been greatly preferable. But I do not begrudge the GTFF from seeking contractual protections for men and women that would prevent them from having to exit their respective programs in the event of pregnancy or severe illness/injury. If Dr. Coltrane and Chairman Lillis meant what they said about drawing the best and the brightest to the University of Oregon, then I suspect they, too, would support such a modest protection to retain those they sought. Instead, they communicated that the $50K/yr was affordable but they did not want to set a precedent where >.49 GTFs received a benefit that other employees did not receive, yet we have received much information to the contrary. So if the principle that they stand on doesn’t actually exist, why else are they choosing not to close this deal? The emergency fund for all grad students was a brilliant move on the administration’s part, and I strongly applaud it. Both parties could have walked away heroes, securing protections for ALL grad students. Why the administration refused to back what they said by making it contractually binding is an absolute mystery. The entire university stood to gain from such a compromise on both sides. Instead, we’re back to square one. Or worse? In addition to representing clients in the courtroom, primarily in the areas of tort defense, construction disputes, and commercial litigation, my practice is more and more focusing on employment and labor disputes, from grievances, to ULP and recognition proceedings, to work at the bargaining table. I find it particularly satisfying when I can assist clients by resolve difference with a “win-win” result that furthers the important relationship between the organization’s management and employees. Conflicted, I’m not in your bargaining unit so obviously I can’t comment on the silencing tactics you experienced (other than to say such tactics have no role in ethical discourse). However, I can commend your willingness to take part in a strike you voted against. That’s one of the things that’s so hard about solidarity–when push comes to shove, it sometimes means taking part in collective actions you may oppose individually. Conflicted, I am truly sorry for how hard this is on you. I am also extremely thankful that you made the hard decision to walk out and I am sorry that more GTFs have not done so. I know my department has failed on the solidarity front, by and large, and I am really afraid that the strike effort was hurt because of it. Here’s hoping that something breaks soon and the whole campus can get back to work in time for the end of term. The GTFF bargaining team has agreed to go back to the bargaining table at the request of our mediator. No word if this means the administration is ready to negotiate over paid leave being guaranteed and in our CBA, but we are always willing to negotiate with our employer. Update: Our mediator asked them if they were ready to negotiate things in our CBA and they are still not willing to negotiate collectively bargained language. So they do not want to meet tomorrow. We continue to want to meet. We even set a time for 2pm tomorrow and are all set to go, we’ll see if they show up. So who will teach winter quarter classes? Now that the strike appears to be poised to go longer than anyone thought, isn’t that a big concern? It is one thing for admins to come up with a random plan to assign bogus grades by whatever means necessary, but quite another to actually have qualified instructors to stand up in front of classes and teach. I’ve had this question, too, and wondered about the effect on WT more generally because the main phase of registration’s already happened. GTF-driven instruction and grading is a major source of revenue from many units, including those who pay their GTFs the least, and employ the most, and thus have the largest numbers on strike. Departments have already allocated GTFs for winter term (and set course caps, many sections now full) with the assumption support will be available, but the chaos of mass cancellations and cap-lowering in courses that will attend a continuing strike will be absolutely incredible. There is another corollary that is much worse, and which I have not yet seen addressed: what happens to grads’ own enrollments–and membership as part of the GTFF–if they’re still on strike in a new term? I assume they’ll be asked to pay tuition, but it’s not exactly easy to scare up a term’s worth of loan funds on short notice, and the (rather ample) cynic in me wonders if that’s part of the administration’s strategery. I thought about the tuition bit, as well as insurance. Which is worse, GTF not being able to pay tuition, or thousands of undergrads with no instructors? It is a dangerous game of chicken going on here. It has nothing to do with the administration; it’s a natural consequence of striking into January. No labor means no tuition waiver. And this should be factored into the GTFF’s strategy. Despite current rhetoric, the GTFF has admitted (and hopefully our leadership still knows) that it cannot engage in a protracted strike. Yet, that’s what they seem to be doing anyways. A month-long strike is simply not possible for our membership. The loss of an entire month’s pay and the prospect of a massive tuition bill (even if it is temporary) will mean that GTFs will go back to work come winter term. But nobody in the union is discussing the consequences of losing pay and having to pay tuition (at least publicly). In fact, the issue of losing wages has been actively dismissed by the union. They’ve also discouraged discussion about the loss of our tuition waiver (especially for international GTFs) by emphasizing that striking as a worker is separate from our identities as students. That’s fine for this term (if you completed the requisite hours; if not they’ve encouraged those GTFs not to strike!). But for the winter term, we need to work a certain number of hours in order to qualify for free tuition. Are you sure that we’ll lose tuition waivers? My department steward reports that our Winter Term GTF positions and the tuition waivers that come with them cannot be taken from us. Do you have a steward? If not, I’d check in with one of the officers. Any other GTFs in the uom ether know more about this? The GTFF lawyers are sure tuition and health insurance are safe for the winter. The CBA contract language states tuition waivers and insurance are provided to those “appointed” at a .2 FTE or above. Tuition waivers and insurance do not kick in once you have completed the necessary amount of work. They all start right at the beginning of the quarter when GTFF appointments start. Were the administration to behave differently in this regard next term because of the strike, it would definitely be a violation of the CBA. extends well into winter term. No. The contracts are already signed. The Administration can’t ask you if you are on strike. They’ve got to prove you haven’t completed the time you were appointed for to pull tuition and insurance at a later date. No departments keep track of how many hours GTFs work because it would reveal just how much they are overworked. If the whole tuition waiver hinged on the word “appointed,” then we would not have to make sure we completed 88 hours before striking. The only risk would be our stipend. But that’s not the case, and the GTFF readily admits to it. The GTFF website states, “by the start of week 10, they [GTFs at 0.29 FTE] will have already completed 88 hours of labor, and their tuition waiver [for fall term] is guaranteed.” Notice how it does not say our waiver is guaranteed because we are “appointed.” You actually have to fulfill your duties in order to get the wavier. Imagine that. The tuition waiver and benefits are given at the beginning of the term in good faith that you will report to your job at the appointed time and complete 88 hours of work for the quarter. It is also a practical matter since tuition is due at the beginning of the term. We are supposed to be “working” at the beginning of our appointment when the wavier is applied—that’s why we are paid for half of September even though classes don’t begin until the very end of September. However, if we are on strike, we are, by default, not “working” at the appointed time and cannot receive either pay or the tuition wavier. Those two things will only appear when we report back to our jobs and start working towards the 88 hours. Withholding the tuition waiver would not be in violation of the CBA because we are simply not reporting to work. If the GTFF “lawyers” are feeding the Bargaining Team and union leadership info that we are guaranteed waivers for winter (if striking past Dog’s date of Dec. 15 or Jan. 5 at the latest) then there are two levels of duplicity going on here. The GTFF’s consulting counsel is Mike Tedesco, a very good labor lawyer who represents a lot of unions. I don’t know what the GTFF leadership is telling its membership, but whatever Tedesco is advising is surely sound. There’s a difference between “guaranteed” and “granted’. Tuition waivers and insurance is granted at the start of the term “in good faith” as you put it. If the Administration can prove GTFs haven’t completed 88 hours some time during the term, they could have their tuition waiver rescinded or insurance cut. They can’t hold those things back just because they think individual GTFs are on strike. An important point to note is that it says “if a strike occurs this quarter” not “if a strike continues into next quarter.” They are making no promises, in writing at least, that we will be covered for the winter term if the strike goes past the fall term. Same goes for their spin on striking international GTFs and their visa status for the winter. Losing tuition waivers is precisely why they’ve admitted in the past that it is not feasible to engage in a protracted or indefinite strike. Our membership cannot suffer the twin burden of actually paying tuition and losing wages. In fact, many of us cannot suffer losing wages at all. About your steward, my hunch is that they are either misinformed (this is actually pretty common) or is just toeing the line in order to diminish concern. Another example of this kind of misdirection concerns lost pay. Both stewards and the union leadership have claimed that we will not lose any wages since the administration has no actual way to check if we are working or not. But guess what…if they have to pay someone else to grade the exams that we should be grading, if other people have to proctor exams on your department’s dime, or if they know you did not show up to teach your class, then you can be pretty sure they will dock your pay. This should be expected and it is a natural consequence of a strike. We could have gotten away scot-free by striking one or two days (they stated to undergrads: “it [the strike] will be like getting one or two snow days”). But by prolonging the strike past its initial two-day projection and into finals, the GTFF leadership has made sure that the university knows who is striking and who is not. Any chance that GTFF could strike with impunity has now passed. Now our leadership has left us with the prospect of losing our entire December stipend and acquiring a massive tuition bill. Thanks for all your replies. I have a much better sense of the situation now. I double checked, and my steward only mentioned waivers and health insurance, which seems key–nothing about course assignments or wages. I’m sure the GTFF is being intentionally vague, but I don’t think it’s for nefarious reasons. More likely, it’s because the truth is more complicated than “yes, everything will be okay” or “no, we will all lose everything ever.” The “true” answer seems like, if the strike progresses past a certain date, we will lose positions and pay. Then the university will charge us tuition. When they do, however, the union lawyer files suit on the basis that tuition is tied to appointment, and people had appointments for winter. If Tedesco is the one providing this info, I’m inclined to trust it. My overall impression is that precisely *how* this all plays out depends entirely on the timing of certain moves, whether on the admin’s or the union’s ends. Not to mention the moves re: BoT, Senate, and faculty. past Dec 15 – the financial start of winter term appointments). are unlikely to lose this. One of the many reasons that the GTA and GRA are not the same flavor of GTFF. Yeah, one of the fascinating things about the strike experience is how it’s revealed just how diverse GTFs’ working conditions are. Before the strike, I thought I had it much worse than I actually do. There are certainly GTFs in other programs & departments with *much* comfier gigs than me, but I’ve talked to a bunch whose situations are pretty dire in comparison too. (I’m in the humanities; we have an inferiority complex. But it’s kinda justified.) I’m curious to know what programs/departments are seeing higher rates of non-striking GTFs. I’ve definitely learned that I need to be more directly involved with my union. I’d always kept up on union news, but had never been involved until last year, when I (first) found the administration’s bargaining tactics so offensive and disgusting. I’m not some 21 year-old kid; I am not here to be insulted or disrespected. But the practical and collective benefit of a lot of us being more involved than we have been: these convos happening on UOM could’ve happened months ago. And they probably should have. GTFs would need to be striking well into February before potentially losing tuition waivers, and even that would be unlikely. The GTFF would never agree to a contract that left it’s members hanging, it is common for unions to make provisions for all striking members as part of the settlement wrap up.